We propose to investigate the function and organization of membrane transporters and receptors at the single-protein level. We will investigate how tumor necrosis factor receptor I (TNF-R1) and associated proteins are organized at the plasma membrane using quantitative single-molecule super-resolution microscopy. The structural organization of TNF-R1 in the plasma membrane and how that is linked to the initiation of specific cellular responses, such as apoptosis and proliferation, is highly debated. We propose to study the structural organization of TNF-R1 and its ligand TNFα at the plasma membrane in fixed and live cells using super-resolution microscopy (single-molecule localization microscopy, SMLM) and single-molecule photobleaching. First, we aim at probing the stoichiometries of TNF-R1/TNFα-complexes in fixed cells. We will extract protein copy numbers in such complexes directly from SMLM data by analyzing fluorescence blinking kinetics. The results will be cross-validated by single-molecule photobleaching experiments. Second, we aim at investigating events of pre-dimerization of TNF-R1, ligand-binding, receptor oligomerization, and internalization at the single-molecule level in live cells. We will perform live-cell single-molecule tracking and will apply a Hidden Markov model to extract information on the association and dissociation kinetics of TNF-R1 before and after ligand binding. Finally, we will feed this data into a rule-based single-molecule model with which we aim to describe TNF-R1 activation. Quantitative analysis of ligand–receptor colocalization reveals reorganization of spatially correlated TNF-R1 with TNFα. a) Binary two-color image of TNF-R1-tdEOS (green) colocalizing with its ligand TNFα-ATTO647N (magenta). b) Corresponding single-molecule colocalization image obtained from CBC-analysis (scale bar 100 nm). The color-code ranges from high colocalization (+1) to anticolocalization (−1) and allows for receptor sorting into ligand bound and ligand-free subgroups on a single-molecule level. 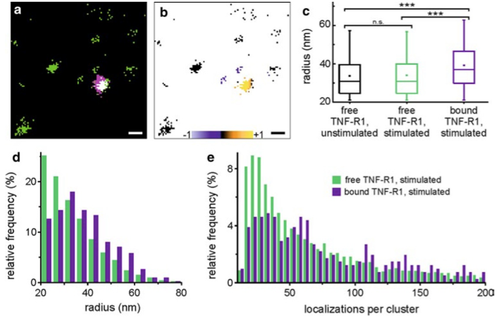 Morphological cluster analysis of quantitative PALM images yields radius and single-receptor localizations per TNF-R1 cluster for unstimulated Hela cells (free TNF-R1, unstimulated, N = 4) and ligand-free/ligand-bound TNF-R1 clusters for stimulated cells free/bound TNFR1, stimulated, N = 8). c) Box plot of receptor cluster radius displays 5th percentile, 25th percentile, median (line), mean (square), 75th percentile, and 95th percentile (P values: n.s., P > 0.05; *0.05 > P > 0.01; **0.01 > P > 0.001; ***0.001 > P). Frequency distributions of cluster radius (d) and localizations per cluster (e). (Figure from Fricke et al., Histochem Cell Biol 2014). 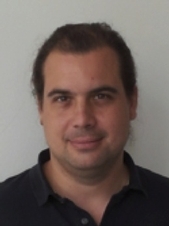 Fricke F, Beaudouin J, Eils R, Heilemann M (2015) One, two or three? Probing the stoichiometry of membrane proteins by single-molecule localization microscopy. Sci Rep 5, 14072. Finan K, Raulf A, Heilemann M (2015) A set of homo-oligomeric standards allows accurate protein counting. Angew Chem Int Ed 54, 12049-52. Kollmannsperger A, Sharei A, Raulf A, Heilemann M, Langer R, Jensen KF, Wieneke R, Tampé R (2015) Live-cell protein labeling with nanometer precision by cell squeezing. Nature Commun 7, 10372. Wieneke R, Raulf A, Kollmansperger A, Heilemann M*, Tampé R* (2015) SLAP: small labelling pair for single-molecule super-resolution imaging. Angew Chem Int Ed 54, 10354-7. Fricke F, Dietz MS, Heilemann M (2015) Single-molecule methods to study membrane receptor oligomerization. ChemPhysChem 16, 713-721. Fricke F, Malkusch S, Wangorsch G, Greiner JF, Kaltschmidt B, Kaltschmidt C, Widera D, Dandekar T, Heilemann M (2014) Quantitative single-molecule localization microscopy combined with rule-based modeling reveals ligand-induced TNF-R1 reorganization toward higher-order oligomers. Histochem Cell Biol 142, 91-101. Dietz MS, Fricke F, Krüger CL, Niemann HH, Heilemann M (2014) Receptor-ligand interactions: binding affinities studied by single-molecule and super-resolution microscopy on intact cells. ChemPhysChem 15, 671-6. Dietz MS, Haße D, Ferraris DM, Göhler A, Niemann HH, Heilemann M (2013) Single-molecule photobleaching reveals increased MET receptor dimerization upon ligand binding in intact cells. BMC Biophysics 6, 6.